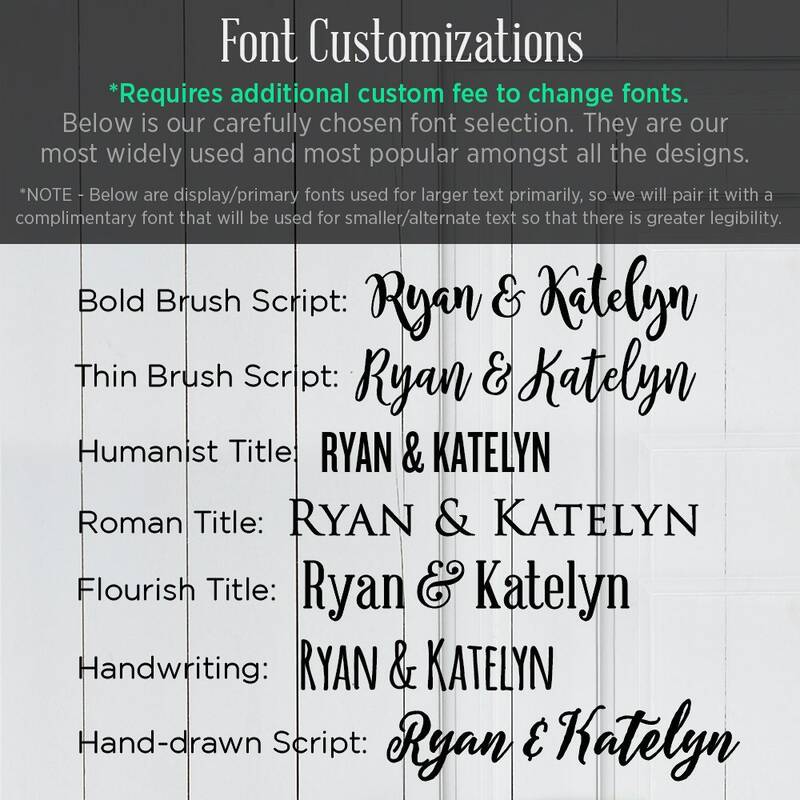 Personalized - is text-only edits to the original design template. So swapping out existing text - while rest of the design remains as shown in product image. This is free. Customized - adding additional lines of text, border changes, font changes, adding a logo, or any other graphical changes that deviate from the design shown in product image. This is an additional fee (see below for more info on custom orders). Digital proof is available by request. You must request proof within 24 hours of purchase. 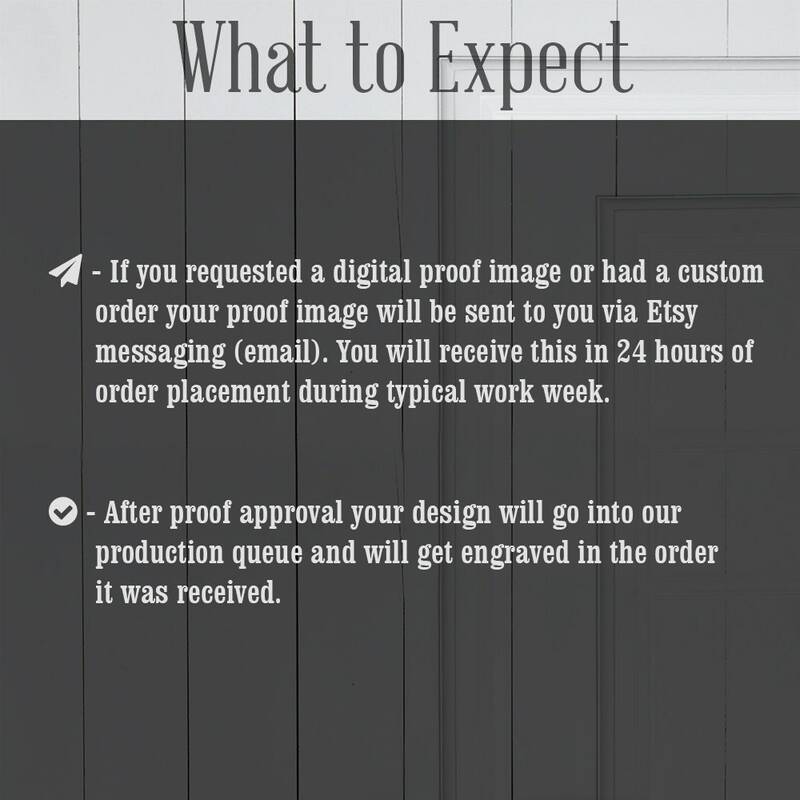 We do not provide a proof if you have not yet placed an order. If you need a proof this may delay the above mentioned time. Incomplete information may delay processing time. If we need to clarify something in your information this may delay the above mentioned time. The time counting begins when we have everything needed to produce your order. If you need to make a change after you have submitted an order and we have not started your order, you will need to cancel your existing order and submit a new order with the desired changes. So please check all of your info before submitting your order. It is VERY IMPORTANT to double check names/dates that you submit to us. Please ensure proper spelling and grammar - customer's are responsible for any errors submitted with order. We cannot accept returns or refunds on engraved items, unless we made an error. 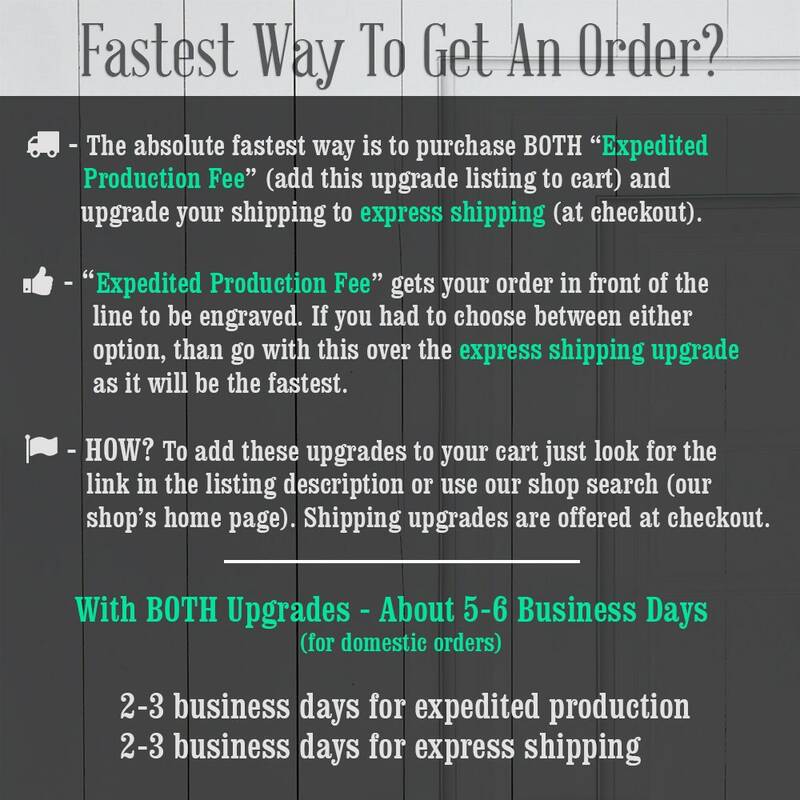 You are given 2 business days to respond to the proof before we move forward with your order in an effort to ship by Etsy's expected ship date. • Couple's names: In the same order as they should be engraved. • Dates: In the same order as it should be engraved. Please note that the date will be in the same format as in the product picture. If you wish for them to be case sensitive please state this in your notes otherwise we will use the same case structure in the image of this product. 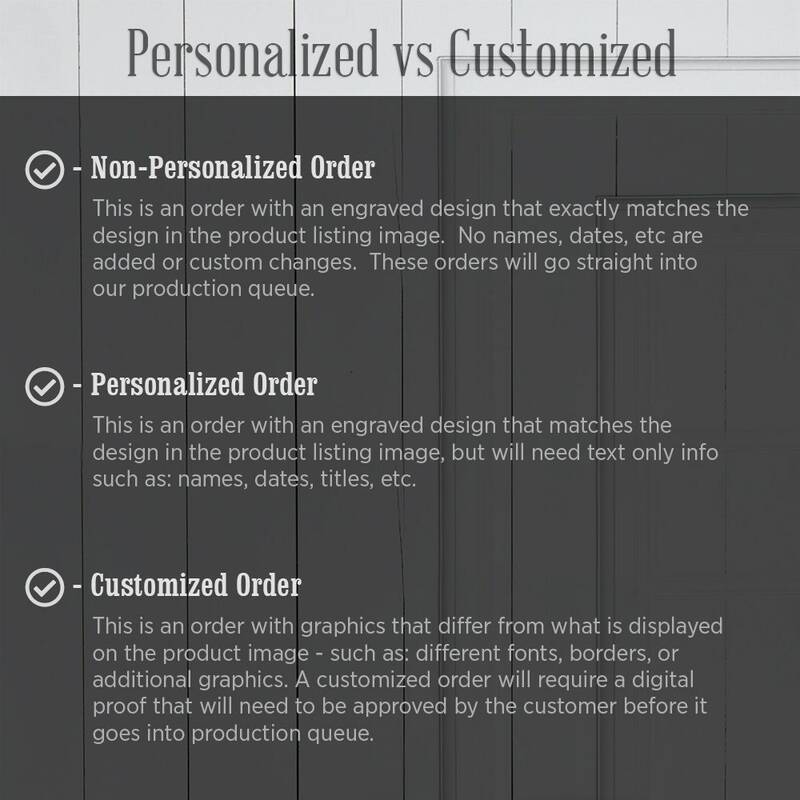 **IMPORTANT: Beside simple personalization, if you include additional customizations: such as additional lines of text or any other customization that goes beyond simply swapping text that already exists in the product display image - you will delay your order. This would include changing the order of things (date moved from top to bottom, last name removed, etc.) In these cases, we will need to reach out to you for clarification, most likely will require you to purchase a custom fee, and then finally create a proof for your approval. If you have a custom request please see next paragraph. HOW DO I CUSTOMIZE BEYOND WHAT IS SHOWN IN THE PRODUCT LISTING IMAGE? If you are looking to add a logo or graphic, add additional lines of text, change border, or change fonts - then you will need to purchase our $20 custom fee. This would include changing the order of things (date moved from top to bottom, last name removed, etc.). This will also require a proofing step as well. So we would send you a proof image for you to approve (typically the following day after order is place). 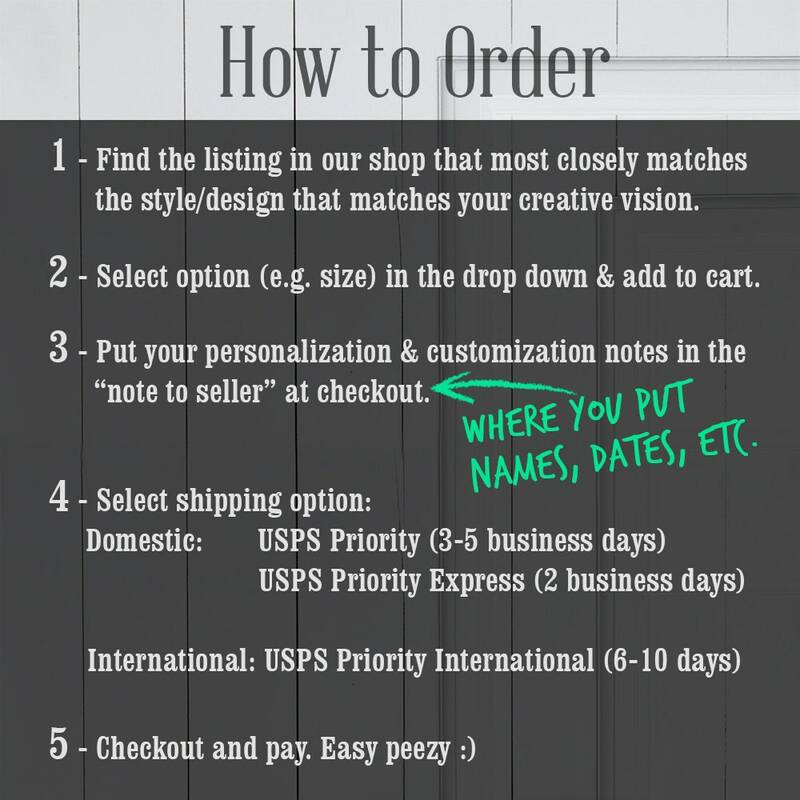 HOW TO PLACE CUSTOM ORDER: You would first pick the listing that most closely matches your vision and add that to your cart. Next, you would add the custom fee to your cart. NEED MESSAGE ENGRAVED ON BACK? Short text message engraved on the back in a 3 x 3 inch area. Text message must be under 15 total words. **NEED IT IN A HURRY? If you want to get your order at the front of the line than purchase our Rush Fee option as well. Due to high volume of sales each December, we have a specific "cut-off date" for orders to arrive by Dec 24 for Christmas. That date cut-off date is subject to change every year. So check our shop banner in December to see the current cut-off date. See link below for shop home page. Our Christmas shipping guarantee covers you in the event your package doesn’t arrive by Dec 24 if you placed your order on or before the cutoff date. We will issue a refund of your shipping fee if you placed your order by cut-off date and it didn't arrived by Dec 24 for any reason. We may also limit our offerings during December to items that are not personalized. We typically build our inventory in months leading up to Christmas and so to focus on fulfilling those orders we may limit our custom “made to order” products. Why should I buy from your shop instead of another Etsy shop or somewhere else online? 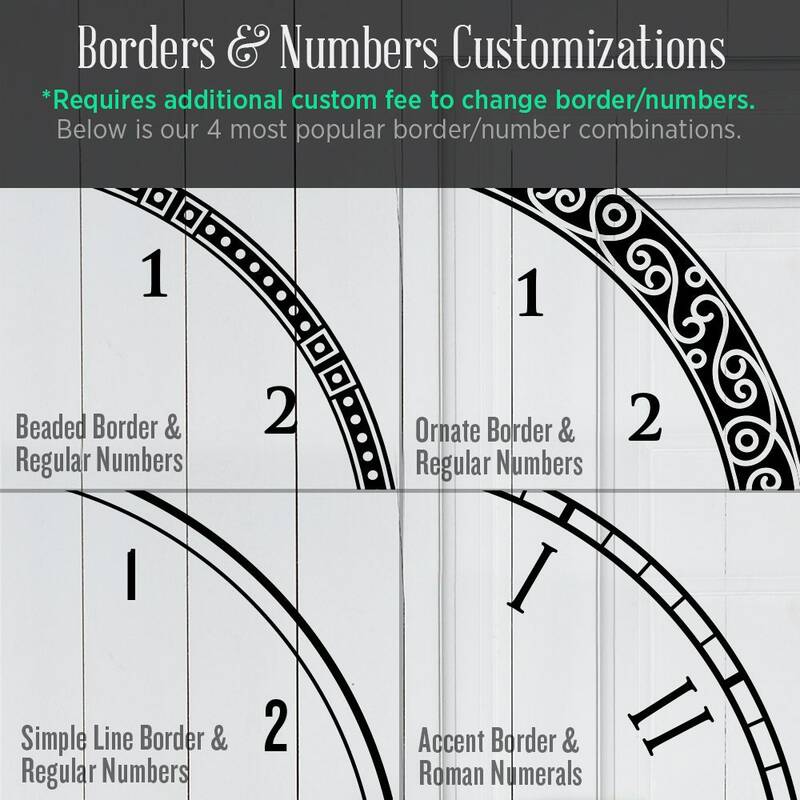 Our laser engraved products are custom made and we create our own designs - which means you wouldn't be able to find these clocks somewhere else. Can I put my own last name instead of the name/dates that are shown in the pictures? Absolutely! That is exactly what we do - we take our designs and customize/personalize it for you. Can I get something changed other than the name/date (eg. different font, logo added, etc.)? Absolutely. We don't want to limit your creative expression - so we offer our customers the ability to customize beyond what is present in the design and even create a completely new design if you desire. We do this by offering custom upcharge packages. 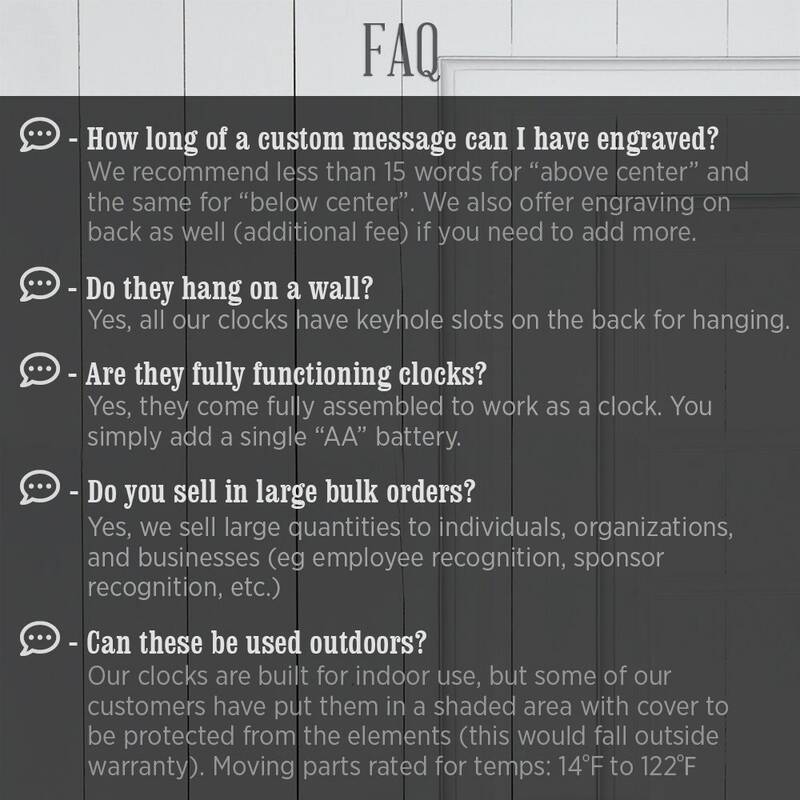 How it works is that you would buy a clock design listed in our store and then you would also purchase a custom upcharge. You will need to reach out to us prior and share with us your creative wishes and we can direct you to which custom upcharge is appropriate. Due to the higher volume of orders received at Christmas time the production lead time might change. During the first couple weeks of December be sure to see our shop announcement or shop banner for our official cut-off date (for orders to arrive in time for Christmas). Do you have a discount code I could use? 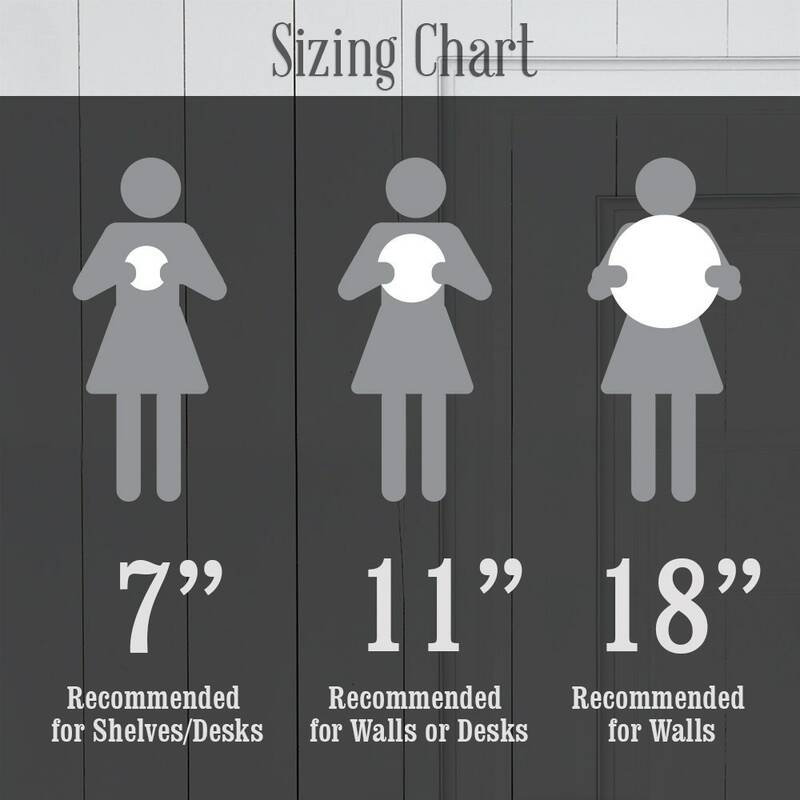 Can I get a clock that is a different shape (eg rectangle) or a different size? 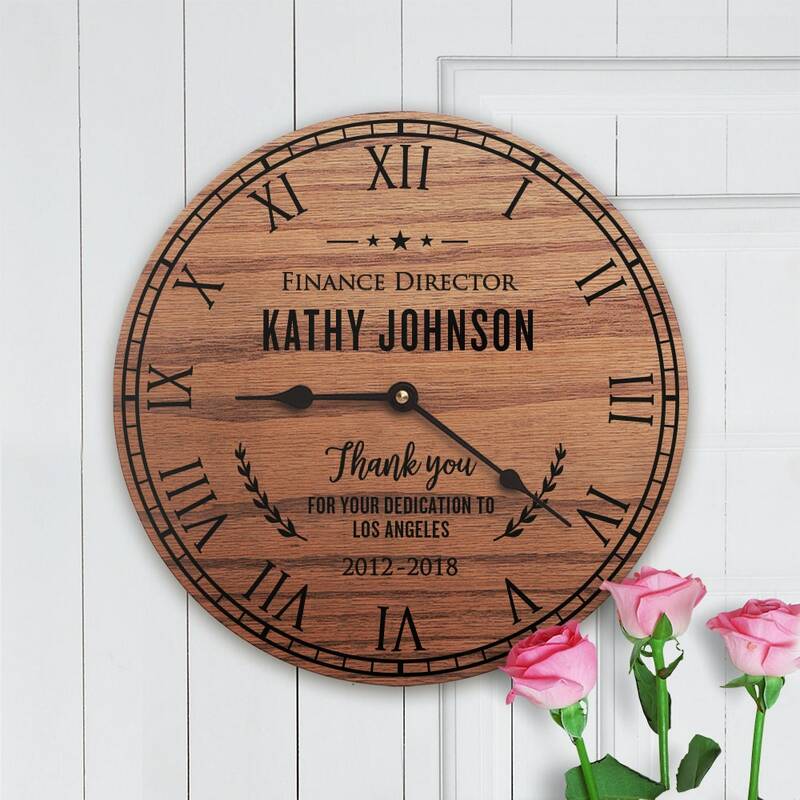 Currently, we only offer circular shape clocks that are 11" in diameter. However, sign up for our email newsletter to find out when new sizes, shapes, and designs become available. Do you offer bundle pricing or higher volume wholesale pricing? Reach out to us if you are interested in getting pricing for greater quantities at wholesale prices. Can you engrave on other objects or materials as well (eg knives, drumsticks, etc.)? No we do not. We only engraved on the products currently listed in our shop. To improve customer experience with quicker turnaround times we no longer offer "made to order" services where everything can be customized to your preferences. All our custom engraveable products are made beforehand and then engraved when an order comes through. So we only offer what we have listed in our shop. That said, if you think of a product size or finish that would be something we should consider offering in our shop - then please reach out to us with your feedback. We love hearing from you. I want to send this as a gift. Is that possible? Yes, many of our orders are gifts. Just enter the correct shipping address of the person getting the gift during checkout. We don't include any pricing in the package inserts. We don't offer gift wrap option at this point.